The following is intended to be a complete overview of marble chess sets. Some of the information will include, care and maintenance of your set, the various types of marble available, a little history, some examples of marble chess sets, and a short buying guide. At the bottom of the page you will notice a place where you can leave a comment. Use that to request further information, add your own knowledge, or comment on anything you read here. When cleaning a marble chess set it is important that you not use any acidic cleansers. Marble is a base in an acid base relationship. That means that when any acidic substance comes into contact with it, a chemical reaction occurs. The result is often discoloration and stains. Unfortunately most household cleansers use acidic properties to kill germs, and are thus unsuitable for cleaning your set. Other acidic substances include most fruit juices, pasta sauce, and lemonade. Fortunately, a well made marble chess set should not need much cleaning or maintenance. Marble is a natural stone, making it durable and resistant. While their are tiny pores in the surface of the stone, they are only big enough to allow liquid stains in, so as long as you don’t spill anything on it you should be fine. For the most part all you need to do is dust the set, and occasionally wash it in warm water without soap. If you find that you need an actual marble cleansing soap, be certain to choose a neutral wash. Contact us at info@pebbleZ.com to request a bottle of special marble safe soap. Marble is the result of a certain type of limestone, composed largely of calcite, undergoing a metamorphic transformation. Aside from being used in elegant chess sets, it is also often found in architecture, sculpture, and material design. Marble is also the informal name often used to describe a whole variety of materials which can take a high polish, some of which are not scientifically considered marble. Onyx is a material which is technically not a marble. 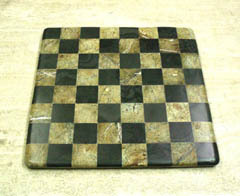 However an onyx chess set will often be labeled under the heading of “marble chess sets” for organizational purposes. Many materials are placed under the label of onyx for organizational purposes as well. The word Marble itself comes from a Greek word, marmaros, which means shining stone. According to the USGS American demand for marble in 2005 was $58.7 million tonnes. Most of this was imported and only $207,000 tons was actually produced by America. Some of this was used as finely ground material, but for the most part the demand was for dimensional stone. Of the various dimensional stone types available, slab, chunk etc. tile is the most popular. Marble has classically been used by artists in decorative work due to its ability to take a high level of polishing without cracking. It also has a slightly translucent property which allows light to penetrate its surface slightly. Chess sets, especially those made from substantial marble, rather than wood or plastic, have been signs of intelligence and sophistication since ancient times. This means that the presence of a marble chess set in a room adds instant elegance and sophistication. It can elevate the presence of a space, giving it added power and making it slightly more intimidating. It also casts whoever is the owner of the set in a positive light, making them seem more intelligent and stronger. This is because chess is a game of wits, a match of inteligence in which two people sit down to wage war against oen anothers best strategies. A chess set in a space is an open invitation to play. It gives anyone the right to ask you to a game. While this does leave you open somewhat, it is also a bit intimidating, and makes you look more confidant. 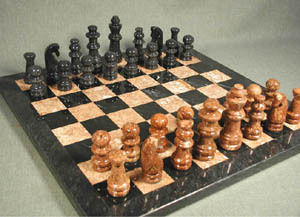 The classic chess set is made from black and white marble. This has been the look of elegance and sophistication for centuries, and similar sets have graced the studies and great halls of countless kings and rulers. 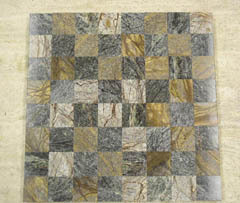 However today, marble chess sets can be found in almost any color. Sometimes you will even find a multicolored marble chess set, where the two contrasting tones each have a variety of colors within them. This allows you to mix and match sets based on the various colors that are present in a room. One thing to consider when choosing the color of your chess set, is whether you want it to stand out as a focal point of the room, or to receed into an overall plan. Choosing a color which contrasts those used throughout the space will make your set stand out, while choosing a complimentary color will help it to flow into the space. It is not known for certain which country first started playing chess. Some claim that it originated in India, since the Persian word for chess is shatranj, which is derived from sanscrit. Others claim that it originated in China. Chess is first refrenced in Persian literature in the 5th century. By the 7th century it had reached china as well. When the Moors conquered the Persians, they picked up the game, and then introduced it to Europe through the conquest of Spain. By the year 1000 AD it had spread throughout Europe. In Europe the pieces received the names that they have today. They were probably renamed because Europeans couldn’t pronounce their persian names. The ancient rules for the game were very different from their current incarnation, with many pieces having severely limited movement. The modern rules began to take effect in the 12th and 13th century in Europe and by 1475 AD the game had reached essentially the same form it does today. 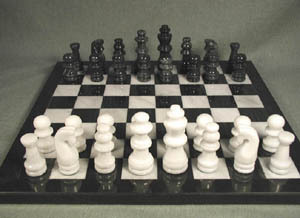 The chess sets we offer are of the highest quality, and are available in a variety of colors, sizes, and styles. We offer fossil stone marble chess sets, onyx stone marble chess sets, as welll as traditional black and white, and black and tan chess sets. This entry was posted on Tuesday, October 9th, 2007 at 11:19 am	and is filed under Home Decor Articles. You can follow any responses to this entry through the RSS 2.0 feed. You can leave a response, or trackback from your own site.